Have you heard the phrase, "A little bit goes a long way?" Sometimes I send a card to my Mom or a friend for no specific reason. When my Mom receives it, she is thrilled and I feel like a million bucks because I've put a big smile on her face. That small gesture made her so happy! Below are some "Just Because" cards from the card swap. Sending one of these cards is sure to put a smile on its recipient! Check out this faux-filigree window card by Rosie N. Gorgeous, right? Rosie told me she cut the design on her Cameo but you could easily replicate this look with any die cutting machine and a more intricate die. Lorraine M. made a stunning background of striated colours as a backdrop for her cutting plate die cut. It love how Lorraine made the focus her die cut - everything else is a complementary addition. 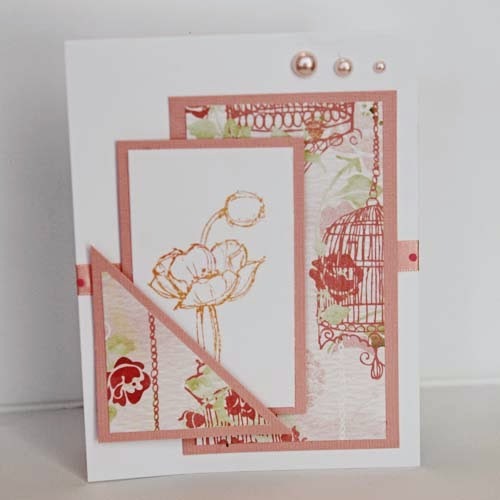 Don't you love this soft muted rose toned card by Tammy L.? 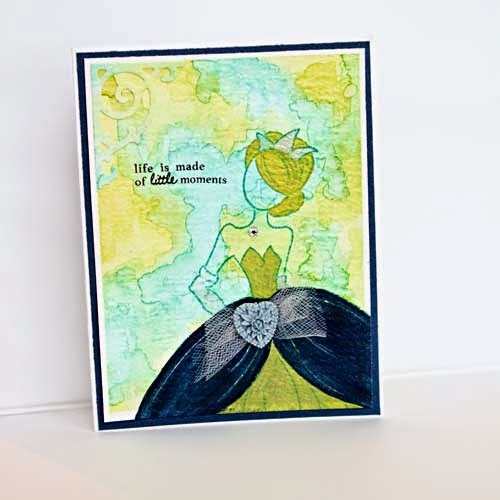 The matted blocks showcase her stamped image beautifully. Ellen's cards are so perfectly coordinated. 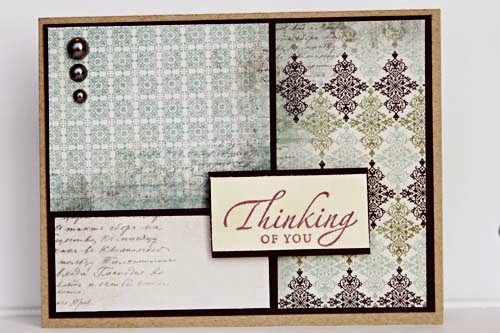 This quilt block look is classic and elegant...just like Miss Ellen! 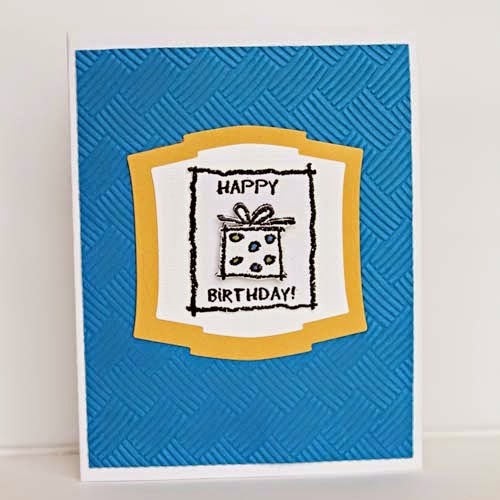 The hints of grey in the blues, taupes and purples make this card so versatile as the recipient could be a male or female. Gorgeous! And lastly, I have shown you my Just Because card in an earlier blog post. That Spellbinders die is so well loved and used! Thanks for dropping by - I hope we have inspired you to create. As you know I peruse various blogs like Jennifer McGuire and Pinterest...and I also watch oodles of videos on YouTube by manufacturers and craft reviewers. Why? Because I love to see what new products are coming to Scrap Shotz, check out the latest trends and even more, I love to see how other artists use the product creatively. All that inspiration incites me to create, create, create!!! One of the recent techniques I have seen is Ombre Colouring or Ombre Stamping. Hero Arts recently released a set of ombre stamp pads - very very cool! It made me wonder how I could achieve a similar result using inks and colours I already had on hand. Using Tattered Rose, Worn Lipstick and Pickled Raspberry, I applied colour to a piece of white cardstock. I made sure to have visible areas where the blended inks appeared so in essence, I wanted to see 5 gradations of colour on my background. Once the colour was applied, I quickly heat set the inks. 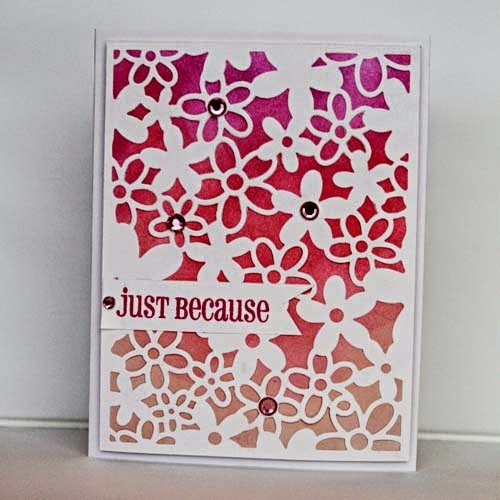 In the interim, I used my Spellbinders Shapeabilities - Floral die to die cut an intricate overlay for the ombre background. Then I adhered the overlay to the ombre background using a nominal amount of liquid adhesive, to not activate the distress inks. A few Prima gems and a quick sentiment the card was finished. I am happy with the results. Do you like the ombre trend??? Hello hello hello!!! 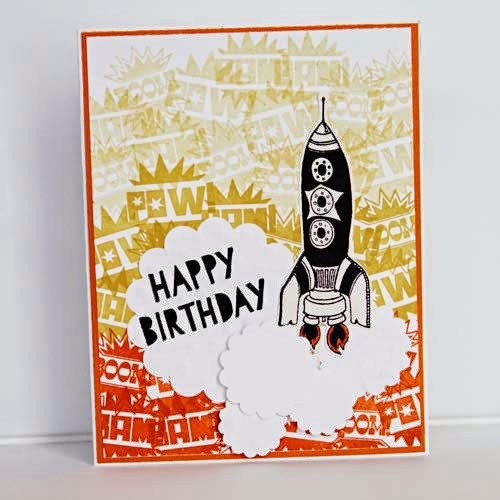 In our recent Scrap Shotz card swap, one of the categories was Kids' Birthday cards. Don't you absolutely love everyone's card? 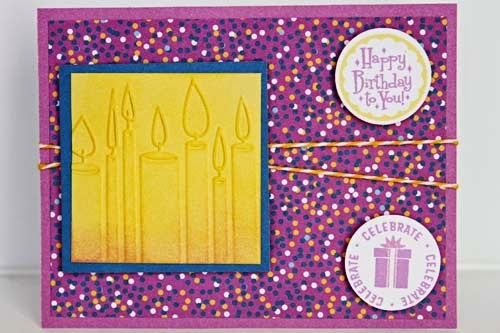 For this card, adhere 4-6 die cuts to create dimension with your die cut on the card. Then colour the Taylored Expressions balloon die cut with Tim Holtz distress ink and spritz it with Ranger Perfect Pearls for some glitz. Add a bow made using the WRMK Envelope board. 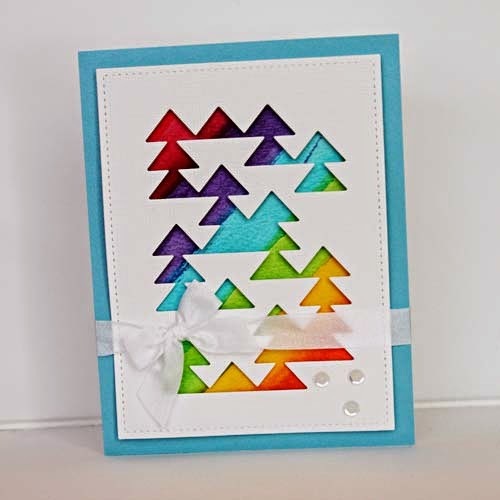 Check out the fresh and fabulous take on ombre stamping on Connie's card! And the innovative use of the scalloped dies as puffs of smoke from the rocket launch - fabulous! 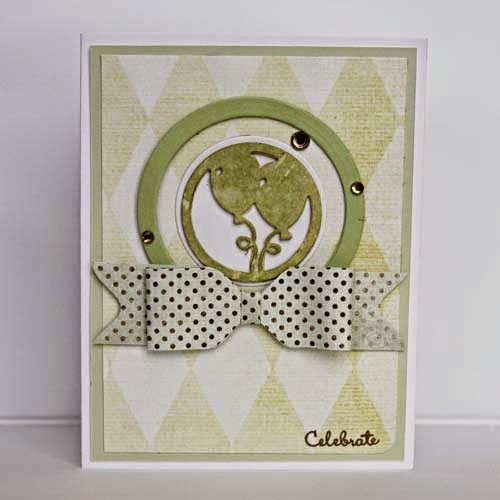 The bouquet of birthday balloons with striped twine are adorable on Lorraine's card. 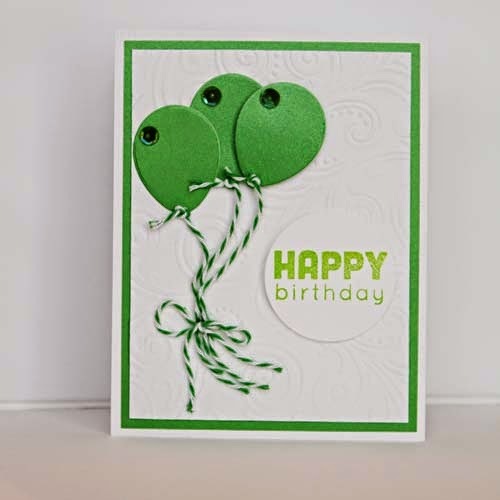 The white background makes the green pop for an eye catching card! 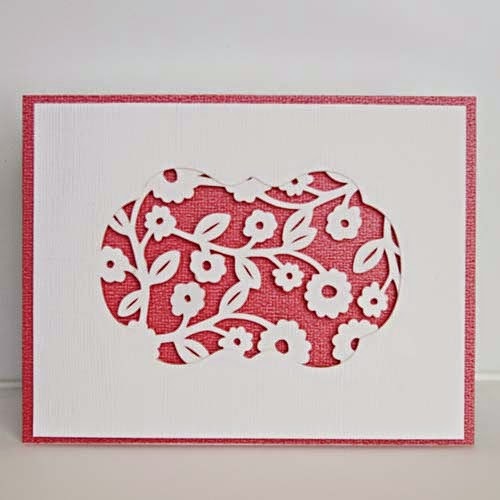 Rosie embossed a basket weave background for her card. The detail yet subtle background complements her dimensional sentiment matted in a bright coloured label shaped die. Absolutely lovely! Who doesn't love an Etch-a-Sketch?? 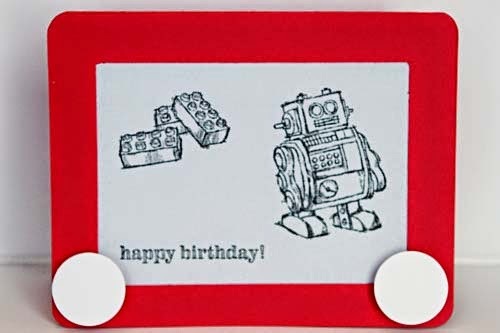 This adorable card by Tammy is a cute take on a kids' favorite toy. Clean, simple and fabulous! And last but not least, here is Ellen's wonderful kids' birthday card. I fell in love with the embossed candles with a touch of ink edging it - doesn't it look like the candle flame. The colours are so very party-like! So where is the party??? I hope you are as inspired by the cards from the card swap as I was! Leave me a comment as I would love to hear from you!